I think Masks slipped under a lot of radars last year, and even as someone who read the book, I really had no idea what a strong impression it made on me until the sequel Shadows showed up and I found myself wanting to dive right in. I do remember being struck by the richness of the world and magic, and realized that I was very much looking forward to continuing the story of protagonist Mara Holdfast. One thing I should mention is that while nothing about these books ostensibly scream Young Adult (at least not on the surface – it’s not really obvious from the cover, not published under a YA imprint, and not mentioned in the description), this really does read like a YA series. It’s more than just the age of the protagonist, who is fifteen years old in Shadows and for most of Masks; thematically and stylistically, the way it was written also made me want to categorize the first book as a YA, and book two only furthered my belief. This is neither good nor bad. However, I just think readers going in should be aware of it since it may affect expectations. I personally chose to view and rate this one as YA. Last we saw her in Masks, Mara had escaped from the mining camps where the tyrannical Autarch sends all those who are labeled traitors and not fit to be part of society. She ends up back at the system of secret coastal caves where a group of underground rebels calling themselves the unMasked Army have made their home. The rebels’ leader has asked Mara to use her gifts to craft special masks for them, which would hide the user’s intent from the Autarch and his Watchers, but untrained and inexperienced with her magic, Mara is frustrated when her attempts to do so fail. At the same time, a mysterious young man washes up on shore, claiming to be a scout from Korellia, a city long thought to have been lost, sunk beneath the seas. But Chell is even more than he appears, and though the unmasked Army remain wary of him, they allow him to accompany Mara on a dangerous mission back into the city in the hopes of reaching Mara’s father, the Autarch’s Master Maskmaker, in order to glean information about the secrets of his trade. Like most second books in a dystopian series, this is the point where the danger and desperation starts to really come to the forefront and can be keenly felt by the reader. The Autarch’s forces continue to close in, pushing Mara and her allies to make riskier decisions, and sometimes those decisions lead to disaster. Mara is already an unstable vessel of magic, trying to learn how to handle her one-of-a-kind powers, and just when the slightest spark can set her abilities off, something akin to a mega-ton explosion happens in her life. It was a twist that was wholly unexpected to me, one that I didn’t think the author would carry through, but in retrospect I shouldn’t really have been that surprised. In both Masks and now in Shadows, the story has taken some pretty dark turns, and the emotional trauma transforms Mara into an uncontrollable element, adding unpredictability to her powers which are already little understood. Mara also grows as a character, in ways that are more than just about her magic. The fact that she is played up to be the most powerful person in Aygrima is still a bit vexing, but it’s also clear from the events in this book that she is far from perfect. To put it simply, some of the decisions she makes are impulsive, inconsiderate, embarrassing, and in several cases, downright dumb. This, however, is not always a negative. Her bad choices indicate vulnerability in her character, showing that despite her staggering power, she’s still just a teenage girl who is prone to mistakes, not to mention she can barely control her gifts. I think it humanizes her and makes her less exasperating than she was in the first book where it almost felt like she could do no wrong. There are definitely more high points than low points in this novel, though there are still a couple weaknesses I should mention. Despite viewing Masks as YA, I did note that a wider audience can probably appreciate it too, since the nature of the fantasy setting and the characters that E.C. Blake has created sets the book apart. Shadows, however, feels distinctly more YA, if that is a comparison I can make. One example is a not-so-subtle hint of a love triangle which manifests itself into a full-blown LOVE SQUARE within the first 40 pages. It eventually resolves itself, and I won’t spoil how, since that in itself is a pretty interesting side-plot. However, it did bug me a little to see romantic drama worm its way into the picture so soon in the story, when there’s so much else that’s more important in Mara’s life. There are also some very dramatic, very exciting developments in this book, but also large chunks of it that felt drawn out, most of it boiling down to Mara being on the run. But as you can see, I really enjoyed this for the most part, especially if I’m looking at it as a YA novel. 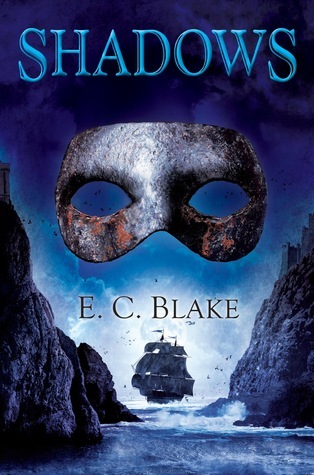 I probably still liked Masks a little more, if I had to compare the two books in the series so far, but Shadows was a worthy sequel and promises to bring even more thrills and delights in the next installment. A 3.5 to 4 star read for me. A review copy of this book was provided to me by the publisher in exchange for an honest review. My thanks to DAW Books! ← Book Review: Generation V by M.L. Brennan + Bonus Iron Night Giveaway! The world is pretty unique, while it’s not immensively deep, I love the idea of the masks and what the author has done with the magic system behind them. Yeah at last I know I should expect something more YA. I saw another review about the book and it was the first time I heard about it. I confess it’s intriguing. I always love a good dystopian novel. Yep, though I think both adults and younger readers can enjoy this and relate to the protagonist. This book reads a little more YA, but I still had a lot of fun with it. I know I looked into the first one, but never read it. At least not yet. I also had no idea they were YA. It’s funny how you can completely forget about a book until the sequel shows up, and then it all comes back to you. I’m not big on love triangles though, so the whole love square thing has made me hesitant to give this series a go even though, for the most part, you’re enjoying it. At least it does get resolved in this installment which bodes well for future novels. Although this one screams “PICK ME UP,” I don’t think I’m going to do it anytime sooner as Mara somewhat reminded me of Sarene, the godsend character of Sanderson’s Elantris which I am currently reading. Argh, she irritated me so much because she’s portrayed as this almost perfect goddess and gives off this aura that she’s the best thing that happened to Arelon. And yet her plans didn’t do anything good. The difference is that my teenager self could forgive Mara because at her age, she’s expected to do stupid stuff. But Sarene is already 25 and acts like….I couldn’t even… I am sorry for rambling so much. Anyway, back to your review, I like that this one didn’t suffer the middle book syndrome but the geometric romance is something that would make readers wary. At least, it didn’t significantly impact your overall opinion of the book. Gosh it must have been a long time since I read Elantris…I can barely remember Sarene though I don’t doubt she’s the idealized character you say she is! Maybe that’s why she never really made an impression on me! And yes, love triangles (and love squares!) bug me. Especially when it comes to YA. But when I do come across them, I give them a chance to resolve in a satisfactory way. I don’t like it when they are dragged on and on for the sake of “romantic tension” (yawn) and I am very glad this book didn’t do that. Never realized it was a YA book. That won’t keep me away from it, but I might let it stay on the to be read list a bit longer. Thanks for the great review. I think I am the opposite. I was under the impression these were YA for some reason. Perhaps that just comes from the focus of the blogs I read reviews for it on though. I had no idea at the beginning, though now I can’t forget if the first book made any mention to the protagonist’s age in the description. That might have clued me in if I had been paying more attention. I agree – even though she was in the camps in the first book I did feel things were more desperate and tense in this one. More action packed too. I also think this is definitely a YA series. It could be a good crossover, at least the first but this second one was much more of a YA book (probably because of her more attention she gave to making eyes at a certain someone). I’m so excited to read the next one. Yeah, I felt the action and tension were pretty well balanced. This second book had its moments, but also when things slowed down, but I liked the dark turns and revelations! Yeah, Masks was definitely under my radar! I had no idea of its existence until reviews of Shadows started popping up. But that’s the beauty of book blogging, right? Recommendations you wouldn’t have gotten otherwise. Sometimes I struggle with YA fantasy because it feels a lot more YA than fantasy – you know the type, with very little to make it stand apart from a contemporary or historical novel. But it sounds like you enjoyed the world building in this one, so I may have to give Masks a go! I know what you mean, it’s hard sometimes to find a YA novel with a good balance. My favorite YA books are the ones I can enjoy as an adult without feeling patronized by the storytelling or the style. Hmm . . . I think I might pass on this one for now. I’m not much for dystopians these days, and while this one sounds like a worthy effort, it going to take something absolutely stupendous to break through my ban 😉 I’m glad you did enjoy though, and thanks for the YA clarification.